Trophoblasts are the outer layer of cells that provide nutrients to the embryo and form part of the placenta. The trophoblast is subdivided into two layers, the inner cytotrophoblast, which proliferates upon implantation, and the outer syncytiotrophoblast, which supports cytotrophoblast proliferation through contact with the maternal blood. The cytotrophoblast, at the edges of the villi in the placenta, further differentiates into extravillous trophoblasts, which penetrate into the uterus and attach to the placenta and the mother to promote placental vasculature. Some trophoblasts replace endothelial cells in the uterine spiral arteries and remodel them into wide-bore conduits that are independent of maternal vasoconstriction. This ensures the fetus receives a steady supply of blood, and that the placenta is not sensitive to damaging fluctuations in oxygen. decidualization: The changes in the endometrial lining after ovulation, characterized by its transformation into a secretory lining in preparation to accept an embryo. extravillous trophoblast: These grow out from the placenta and penetrate into the decidualized uterus. trophoblast: The membrane of cells that forms the wall of a blastocyst during early pregnancy, and also provides nutrients to the embryo and later develops into part of the placenta. Trophoblasts (from the Greek words trephein, to feed, and blastos, germinator) are cells that form the outer layer of a blastocyst. These cells provide nutrients to the embryo and develop into a large part of the placenta. They are formed during the first stage of pregnancy and are the first cells to differentiate from the fertilized egg. This layer of trophoblasts is also collectively referred to as the trophoblast, or, after gastrulation, the trophectoderm, as it is then contiguous with the ectoderm of the embryo. Trophoblasts play an important role in embryo implantation and interaction with the endometrium of the maternal uterus following decidualization. The trophoblast is composed of two layers: an inner cytotrophoblast and an outer syncytiotrophoblast. The syncytiotrophoblast is non-proliferative and thus relies on fusion of the underlying cytotrophoblast cells to expand. The syncytiotrophoblast are the cells in direct contact with the maternal blood that reaches the placental surface, and thus facilitates the exchange of nutrients, wastes, and gases between the maternal and fetal systems. Cytotrophoblast in the tips of villi can differentiate into another type of trophoblast called the extravillous trophoblast. Extravillous trophoblasts grow out from the placenta and penetrate into the decidualized uterus. This process is essential not only for physically attaching the placenta to the mother, but also for altering the vasculature in the uterus to allow it to provide an adequate blood supply to the growing fetus as pregnancy progresses. Some of the trophoblast even replaces the endothelial cells in the uterine spiral arteries as they remodel these vessels into wide bore conduits that are independent of maternal vasoconstriction. This ensures the fetus receives a steady supply of blood, and the placenta is not sensitive to fluctuations in oxygen that could cause it damage. Intrauterine growth restriction (IUGR) can result in an undersized fetus with poor organ development or even death. The primary factor in IUGR is placental dysfunction caused by a failure of the extravillous trophoblasts to penetrate and modify the uterine spiral arteries. The result is a poorly-oxygenated environment and reduced fetal growth. The floor of the amniotic cavity is formed by the embryonic disc. In humans, the formation of the embryonic disc occurs after implantation and prior to embryonic folding (between about day 14 to day 21 post-fertilization). The embryonic disc is derived from the epiblast layer, which lies between the hypoblast layer and the amnion. The epiblast layer is derived from the inner cell mass. The formation of the bilaminar embryonic disc precedes gastrulation. optic disc: The location where ganglion cell axons exit the eye to form the optic nerve. bilaminar: Formed of, or having, two laminae, or thin plates. The floor of the amniotic cavity is formed by the embryonic disc, which is composed of a layer of prismatic cells and the embryonic ectoderm. It is derived from the inner cell mass and lies adjacent to the endoderm. In humans, the formation of the embryonic disc occurs after implantation and prior to embryonic folding (between about day 14 to day 21 post-fertilization). The embryonic disc is derived from the epiblast layer, which lies between the hypoblast layer and the amnion. The epiblast layer is derived from the inner cell mass. 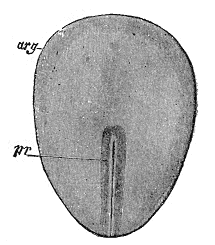 Surface view of a rabbit embryo: A drawing of a rabbit embryo that identifies the embryonic disc and the primitive streak (arg—embryonic disc; pr—primitive streak). The embryonic disc forms during early development. By the blastocyst stage, the embryo is a hollow ball of cells with the inner cell mass (embryoblast) off to one side, and the blastocystic cavity fills the remainder of the sphere. As the embryo progresses in implantation, a small space appears in the embryoblast and forms the amniotic cavity. Simultaneously, morphological changes occur in the embryoblast that result in the formation of a flat, almost circular bilaminar plate of cells that include the epiblast and the hypoblast—the embryonic disk. The epiblast forms the floor of the amniotic cavity and is continuous with the amnion. The hypoblast forms the roof of the exocoelomic cavity and is continuous with the thin exocoelomic membrane. The formation of the bilaminar embryonic disc precedes gastrulation. As gastrulation progresses, the embryonic disc becomes trilaminar and the notochord is formed. Through the process of neurulation, the notochord induces the formation of the central nervous system in the embryonic disc. The amnion contains the fluid that cushions and protects the fetus. In humans, the amnion is present in the earliest observed embryonic stage, appearing as a cavity within a mass of cells. The amniotic cavity is roofed in by a single stratum of flattened, ectodermal cells, called the amniotic ectoderm, while the floor is composed of the prismatic ectoderm of the embryonic disk. Outside the amniotic ectoderm, a thin layer of mesoderm is connected by the body stalk with the mesodermal lining of the chorion. By approximately the fourth to fifth week, amniotic fluid (liquor amnii) begins to accumulate in the amnion, which increases in quantity and expands to contact the chorion. During the later stages of pregnancy, the amniotic fluid allows easier and more fluid movements of the fetus and diminishes the risk of injury. amniotic fluid: In placental mammals, a fluid contained within the amnion membrane that surrounds a developing embryo or fetus (also called liquor amnii). embryonic disk: The floor of the amniotic cavity is formed by the embryonic disk (or disc), which is composed of a layer of prismatic cells. amnion: The innermost membrane of the fetal membranes of reptiles, birds, and mammals; the sac in which the embryo is suspended. chorion: One of the membranes that exist during pregnancy between the developing fetus and mother. Amnion: The human fetus is enclosed within the amnion. The amnion is a closed sac appearing in the inner cell mass as a cavity. This cavity is roofed in by a single stratum of flattened, ectodermal cells called the amniotic ectoderm. Its floor consists of the prismatic ectoderm of the embryonic disk. The continuity between the roof and the floor is established at the margin of the embryonic disk. Outside the amniotic ectoderm is a thin layer of mesoderm (continuous with that of the somatopleure), which is connected by the body stalk with the mesodermal lining of the chorion. When first formed, the amnion is in contact with the body of the embryo, but by about the fourth or fifth week, amniotic fluid (liquor amnii) begins to accumulate within it. This fluid increases in quantity, causing the amnion to expand and ultimately to adhere to the inner surface of the chorion so that the extra-embryonic part of the coelom is obliterated. This increase continues up to the sixth or seventh month of pregnancy, after which it diminishes somewhat. At the end of pregnancy, it amounts to about one liter. The amniotic fluid allows some free movement for the fetus during the later stages of pregnancy and also diminishes the risk of injury. It contains less than two percent solids, and consists mainly of urea and other extractives, inorganic salts, a small amount of protein, and, frequently, a trace of sugar. Note: That some of the liquor amnii is swallowed by the fetus is proved by the fact that epidermal debris and hairs have been found among the contents of the fetal alimentary canal. 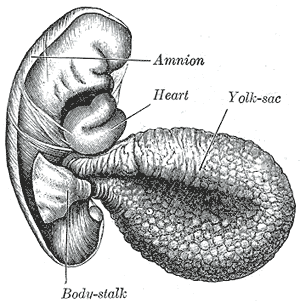 The yolk sac is vascularized and contributes nutrients to the embryo. The yolk sac is the earliest visible portion of the gestational sac and is situated on the ventral portion of the embryo, arising from extra-embryonic endoderm. The blood to and from the yolk sac is conveyed via the primitive aorta and vitelline circulation. 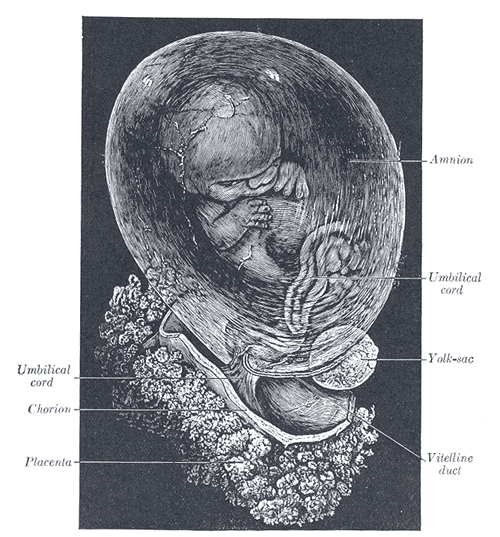 At approximately the end of the fourth week, the yolk sac is connected to the primitive digestive system, which allows the yolk sac to contribute nutrients to the embryo. yolk sac: A membranous sac attached to an embryo that provides early nourishment in the form of yolk in bony fishes, sharks, reptiles, birds, and mammals. It functions as the developmental circulatory system of the human embryo before internal circulation begins. vitelline circulation: The system of blood flowing from the embryo to the yolk sac and back again. gestational sac: The gestational sac (or gestation sac) is the only available intrauterine structure that can be used to determine if an intrauterine pregnancy (IUP) exists until the embryo is identified. Heuser’s membrane: Also called the exocoelomic membrane, it is a short lived combination of hypoblast cells and extracellular matrix. mesenchyme: A type of tissue characterized by loosely associated cells that lack polarity and are surrounded by a large extracellular matrix. The yolk sac is the first element seen in the gestational sac during pregnancy. In humans, it is usually visible at five weeks of gestation. Identifying a true gestation sac is a critical landmark, and is reliably seen in early pregnancy through ultrasound. The yolk sac, situated on the ventral aspect of the embryo, is lined by extra-embryonic endoderm, outside of which is a layer of extra-embryonic mesenchyme derived from the mesoderm. Blood is conveyed to the wall of the sac by the primitive aorta. After circulating through a wide-meshed capillary plexus, it is returned by the vitelline veins to the tubular heart of the embryo. This vitelline circulation absorbs nutritive material from the yolk sac that is conveyed to the embryo. Yolk sac: The yolk sac is a membranous sac attached to the embryo that provides nourishment in the form of yolk. At the end of the fourth week, the yolk sac has the appearance of a small, pear-shaped vesicle (umbilical vesicle) opening into the digestive tube by a long, narrow tube, the vitelline duct. The vesicle can be seen in the afterbirth as a small, somewhat oval-shaped body whose diameter varies from 1 mm to 5 mm. It is situated between the amnion and the chorion and may lie on or at a varying distance from the placenta. As a rule, the vitelline duct undergoes complete obliteration during the seventh week. In about 2% of the cases, its proximal portion persists as a diverticulum from the small intestine (Meckel’s diverticulum), which is situated about 60 cm proximal to the ileocecal valve. It may be attached by a fibrous cord to the abdominal wall at the umbilicus. Sometimes, a narrowing of the lumen of the ileum is seen opposite the site of attachment of the duct. The yolk sac starts forming during the second week of embryonic development, at the same time of the shaping of the amniotic sac. The hypoblast starts proliferating laterally and descending. In the meantime Heuser’s membrane, located on the opposite pole of the developing vesicle, starts its upward proliferation and meets the hypoblast. The sinusoids are capillaries that develop after implantation to allow the exchange of gas and nutrients with the mother. The vitelline veins drain blood from the yolk sac. Portions of the veins above the upper ring become interrupted by the developing liver and broken up by it into a plexus of small capillary -like vessels termed sinusoids. Sinusoids are found in the liver, lymphoid tissue, endocrine organs, and hematopoietic organs such as the bone marrow and the spleen. Sinusoids found within the terminal villi of the placenta are not comparable to these because they possess a continuous endothelium and complete basal lamina. sinusoid: Any of several channels through which venous blood passes in various organs. trophoblastic lacunae: Spaces in the early syncytiotrophoblastic layer of the chorion present prior to the development of the villi. vitelline veins: Veins that drain blood from the yolk sac. The vitelline veins drain blood from the yolk sac. At first, they run upward in front on either side of the intestinal canal and, subsequently, unite on the ventral aspect of the canal. Beyond this, they are connected to one another by two anastomotic branches, one on the dorsal and the other on the ventral aspect of the duodenal portion of the intestine. Thus, it is encircled by two venous rings. 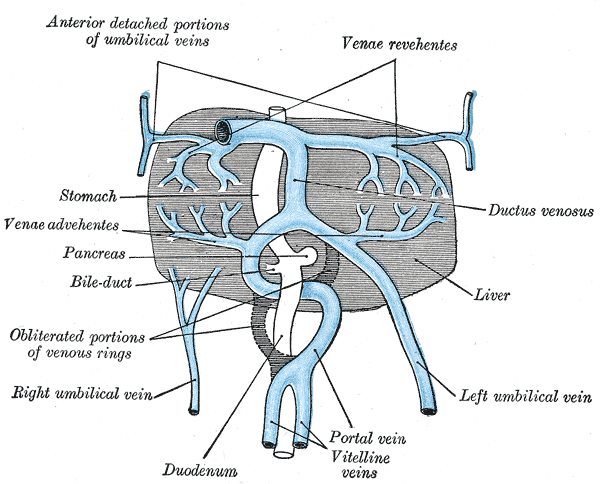 The superior mesenteric vein opens into the middle or dorsal anastomosis. The portions of the veins above the upper ring become interrupted by the developing liver and broken up by it into a plexus of small, capillary-like vessels termed sinusoids. A sinusoid is a small blood vessel that is a type of capillary similar to a fenestrated endothelium. Sinusoids are actually classified as a type of open pore capillary (that is, discontinuous) as opposed to fenestrated. Fenestrated capillaries have diaphragms that cover the pores, whereas open pore capillaries lack a diaphragm, having just an open pore. The open pore endothelial cells greatly increase their permeability. Permeability is also increased by large intercellular clefts and fewer tight junctions. The level of permeability can allow small and medium-sized proteins, such as albumin, to readily enter and leave the blood stream. Sinusoids are found in the liver, lymphoid tissue, endocrine organs, and hematopoietic organs, such as the bone marrow and the spleen. Sinusoids found within the terminal villi of the placenta are not comparable to these because they possess a continuous endothelium and complete basal lamina. The invasion of endometrial sinusoids by the trophoblast allows maternal blood flow into the trophoblastic lacunae; this forms the uteroplacental blood circulation. The extra-embryonic coelom is a cavity that contains the chorion. It is located between Heuser’s membrane and the trophoblast. The extra-embryonic coelom develops at the same time as the primitive yolk sac through the proliferation and differentiation of hypoblast cells into mesenchymal cells that fill the area between Heuser’s membrane and the trophoblast. The entire structure is enclosed by the chorionic plate. The extra-embryonic mesoderm is subdivided into two layers: the extra-embryonic splanchnopleuric mesoderm, which is outside the primitive yolk sac; and the extra-embryonic somatopleuric mesoderm, which is adjacent to the cytotrophoblast. The chorion is one of the membranes that exist during pregnancy between the developing fetus and mother. chorion: The protective and nutritive membrane that attaches higher vertebrate fetuses to the uterus. Heuser’s membrane: Heuser’s membrane (or the exocoelomic membrane) is a short-lived combination of hypoblast cells and extracellular matrix. coelum: Also called the chorionic cavity, this is a portion of the conceptus that consists of a cavity between Heuser’s membrane and the trophoblast. 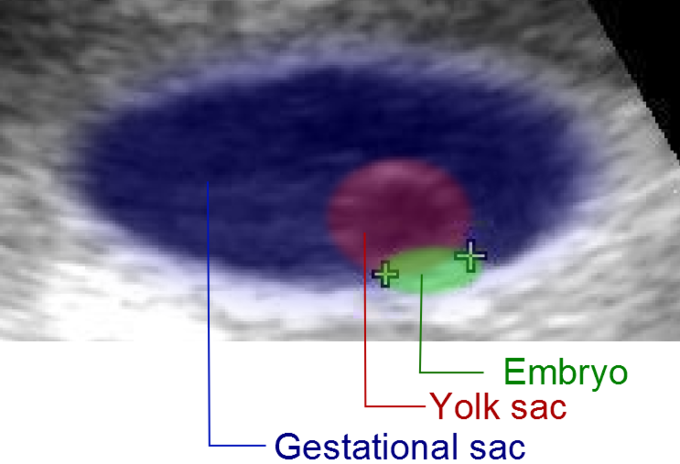 Gestational sac: An artificially colored image of the contents in the cavity of the uterus seen at approximately 5 weeks of gestational age by obstetric ultrasonography. The extra-embryonic coelom (or chorionic cavity) is a portion of the conceptus consisting of a cavity between Heuser’s membrane and the trophoblast. During the formation of the primitive yolk sac, some of the migrating hypoblast cells transdifferentiate into mesenchymal cells that fill the space between Heuser’s membrane and the trophoblast to form the extra-embryonic mesoderm. As development progresses, small lacunae begin to form within the extra-embryonic mesoderm that become larger and form the extra-embryonic coelom. 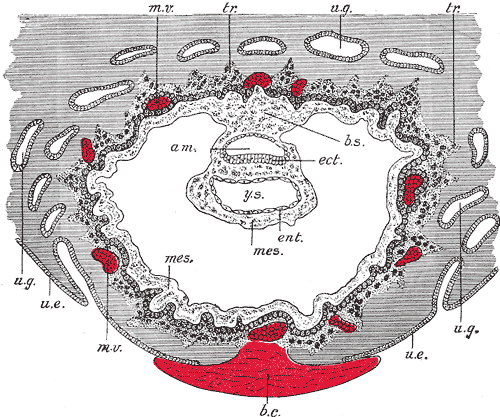 The extra-embryonic mesoderm is divided into two layers: the extra-embryonic splanchnopleuric mesoderm, which lies adjacent to Heuser’s membrane around the outside of the primitive yolk sac; and the extra-embryonic somatopleuric mesoderm, which lies adjacent to the cytotrophoblast layer of the embryo. aspect of the placenta that gives rise to chorionic villi. The chorion is one of the membranes that exist during pregnancy between the developing fetus and the mother. It consists of an extra-embryonic mesoderm and two layers of trophoblast and surrounds the embryo and other membranes. Villi emerge from the chorion, which invade the endometrium, destroy the uterine decidua, and allow the transfer of nutrients from maternal blood to fetal blood. Chorionic villi are at first small and nonvascular, and consist of only trophoblast, but they increase in size and branch. Blood is carried to the villi by the paired umbilical arteries, which branch into chorionic arteries and enter the chorionic villi as cotyledon arteries. After circulating through the capillaries of the villi, the blood is returned to the embryo by the umbilical veins. Until about the end of the second month of pregnancy, the villi cover the entire chorion, and are almost uniform in size; but, after this stage, they develop unequally.